To me, a perfectly ripe juicy peach is synonymous with summer sunsets and can be as sweet as candy but a whole lot better for you! High in flavonoids, nutrients with powerful antioxidants and anti-inflammatory properties, peaches’ health benefits for 60 calories per tennis-ball sized fruit are of many. Add versatile peaches to your grocery basket for a sweet snack, dessert, or the main ingredient in smoothies or fruit salsas that compliment grilled chicken, pork, or fish. 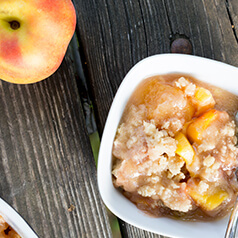 In celebration of August being National Peach month, what better way to celebrate than with trying new healthy recipes bursting with sweet peachy flavor! For optimal storage, keep firm peaches at room temperature stem placed down. Once they’ve fully ripened, store in the fridge in the produce drawer. Wash just before eating. The sweetness of in-season peaches paired with a crunchy nutty topping won’t make you miss the sugar-laden or carb-heavy pies and cobblers popular as late summer desserts. Use this recipe as a guideline to experiment with other fruit or fruit combinations. Some of my favorites are peach and raspberry, peach and blueberry, or 100% mixed berry. In a large sauce pot over medium heat, combine the peaches, vanilla, butter, and cinnamon. Stir well until the liquid is bubbling; allow to simmer until the peaches are fork-tender. Turn off the heat and allow to sit while you make the crumble. To make the crumble, pour the nuts, dates, and shredded coconut in the bowl of a large food processor. Process until a crumbly texture is formed, then add in the coconut oil, salt, cinnamon, and almond extract. Process again, until a sticky and crumbly mixture is formed. (It should look and feel like a thick paste). Pour the peach filling into a 9-inch square baking dish; sprinkle the crumble over the top evenly. Bake at 350° for 25-30 minutes, or until the top is lightly golden and fruit is bubbling slightly.